Ethernet Orchestra are pleased to present the first album of live recordings from tele-improvisatory performances going back 4 years. ‘Diaspora’ is released through the Chilean net label Pueblo Nuevo and contains a diverse selection of musical improvisations by musicians from equally diverse cultures and musical traditions. 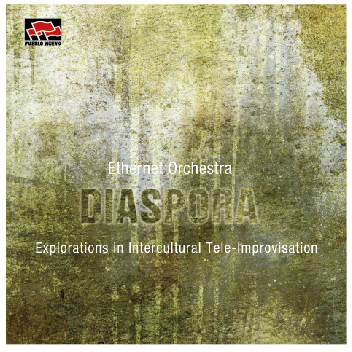 “Diaspora” is the debut album from the Ethernet Orchestra, an Internet based music ensemble founded by Roger Mills that explores the performance of intercultural tele-improvisation. It is a compilation of live freely improvised vignettes from performances recorded between 2009-2014. It features musicians from a diverse range of cultures and musical traditions performing simultaneously between Iran and Australia via North America, Canada, Brazil and Europe. During this period we also had the great fortune to collaborate with the late Richard Lainhart, who is featured on many of the recordings. Ethernet Orchestra would like to dedicate this album to Richard, whose passion and generosity touched us all and his music continues his presence in our lives. Thanks also goes to Richards wife, Caroline Meyers for the sleeve design.